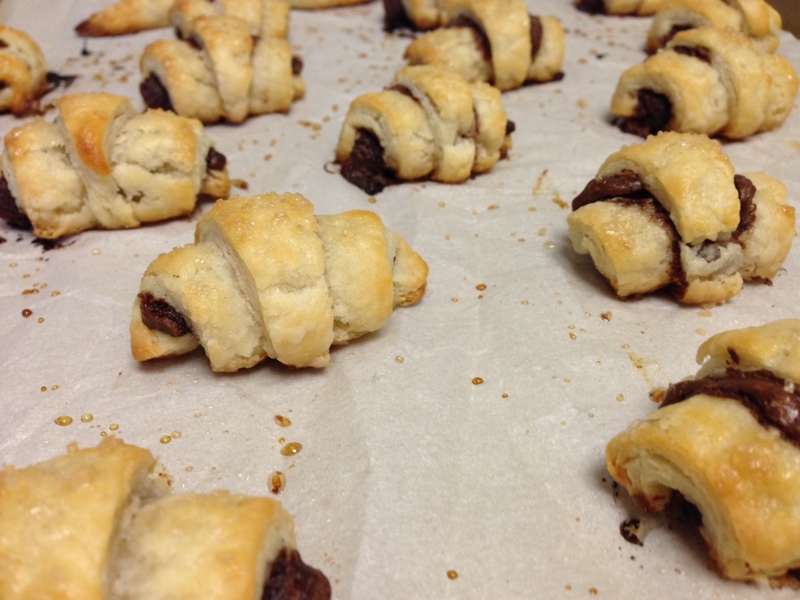 Have you ever heard of rugelach? They are a traditional Jewish pastry – often made with a cream cheese or sour cream dough, and consisting of a bit of pastry rolled around a filling. You will find them with a million different kinds of fillings – fruit, nuts, fruit AND nuts, chocolate, chocolate AND fruit, and so on and so on. The ones I remember having as a kid were usually raspberry, peach, and pecan or walnut (occasionally a combination of fruit and nuts), but you can really use any kind of filling you like! 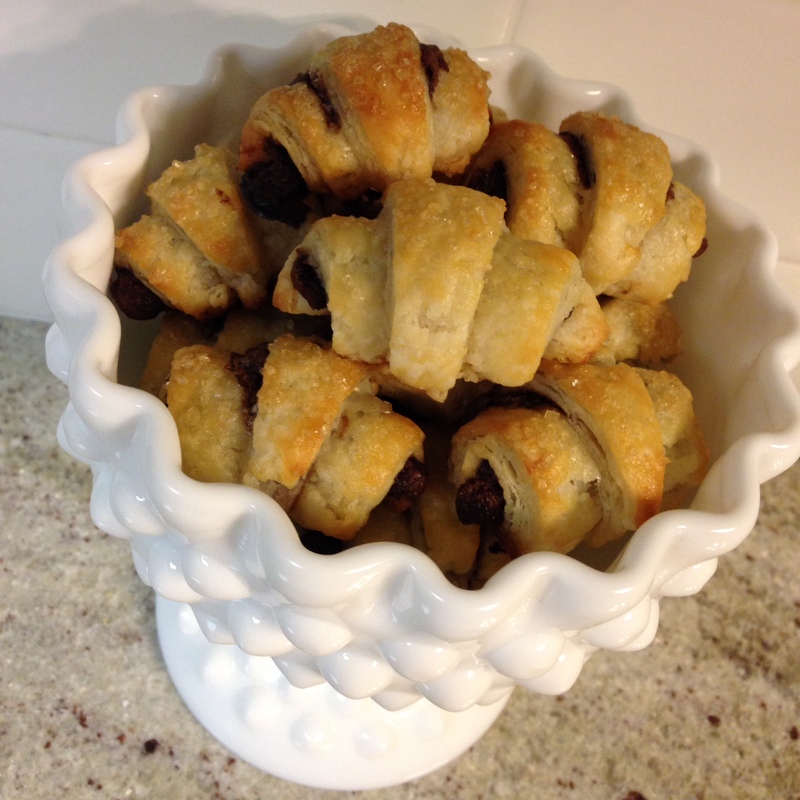 I plan to experiment with some more varieties – but nutella seemed like a delicious way to start. You can’t really argue with the ease and deliciousness of nutella, can you? No, you cannot. 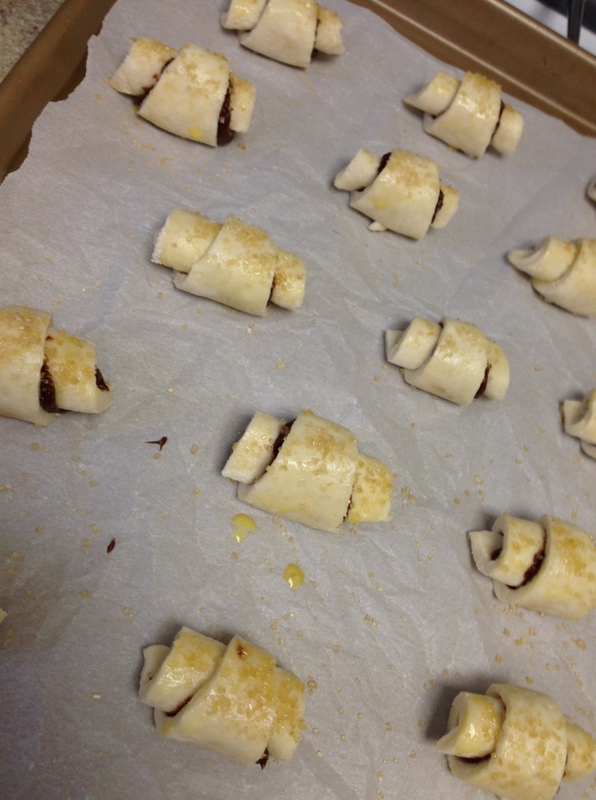 Anyways, the making of rugelach is quite simple: make pastry dough, cut it into wedges, fill, roll, and bake. Tada! 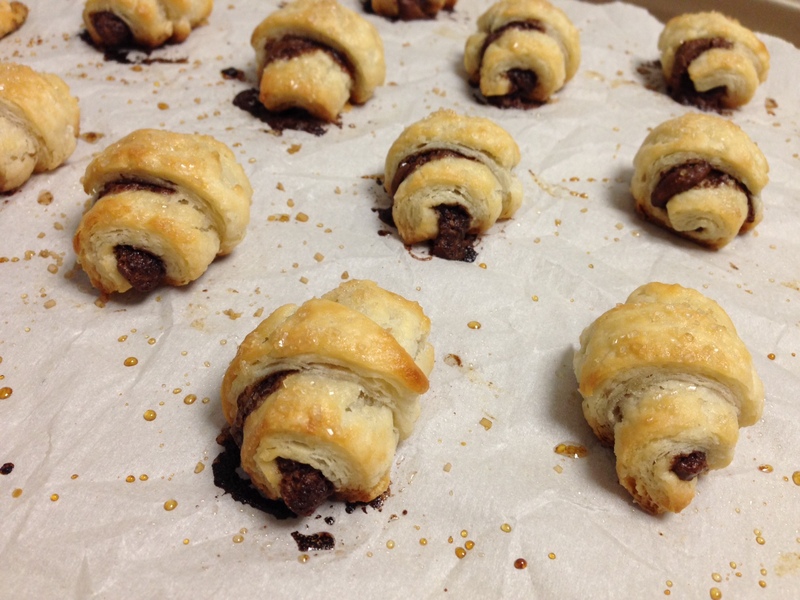 Rugelach! Though I prefer to make my own pastry dough, you can absolutely make these with a pre-made pie crust, especially if you’re in a time crunch. I won’t judge. 1.) In a food processor, add the flour, salt, sugar, and butter cubes. Pulse until the butter is just cut into the flour, and there are pea-size pieces of butter (about 4-5 pulses). 5.) 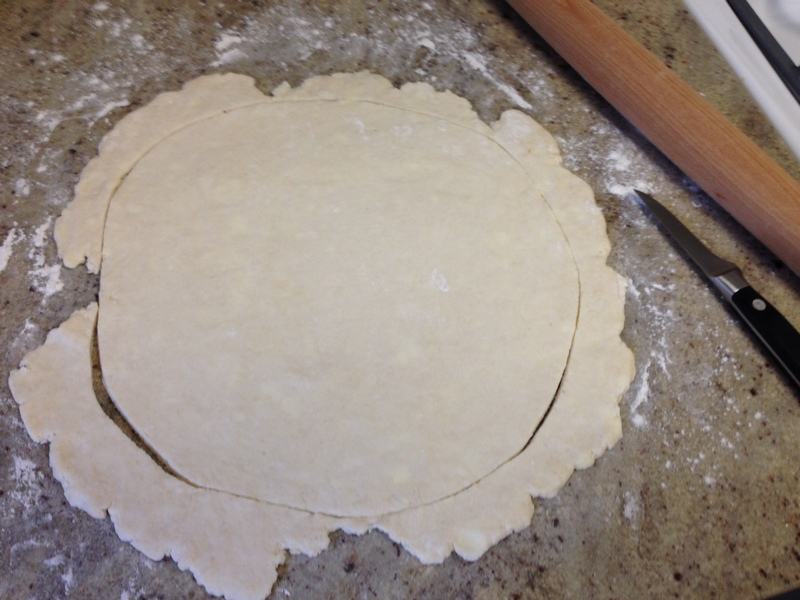 Once the dough is rolled out, cut it into a rough circle shape (basically, just trim off the jagged edges). Remove the scrap edges, and then cut each circle into 16 wedges. 6.) 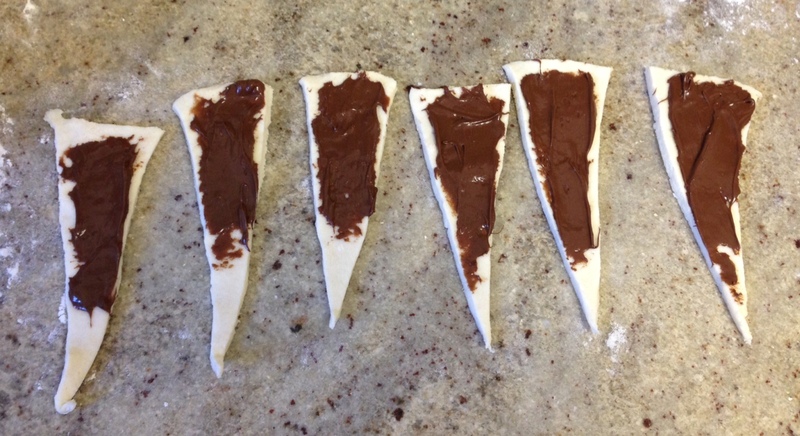 Using a small spatula, spread nutella onto each wedge; you want to cover it as well as you can from top to bottom, leaving a thin but substantial layer of filling (you don’t want it to be gloppy, but you want to have enough filling that you can taste it in the final product). 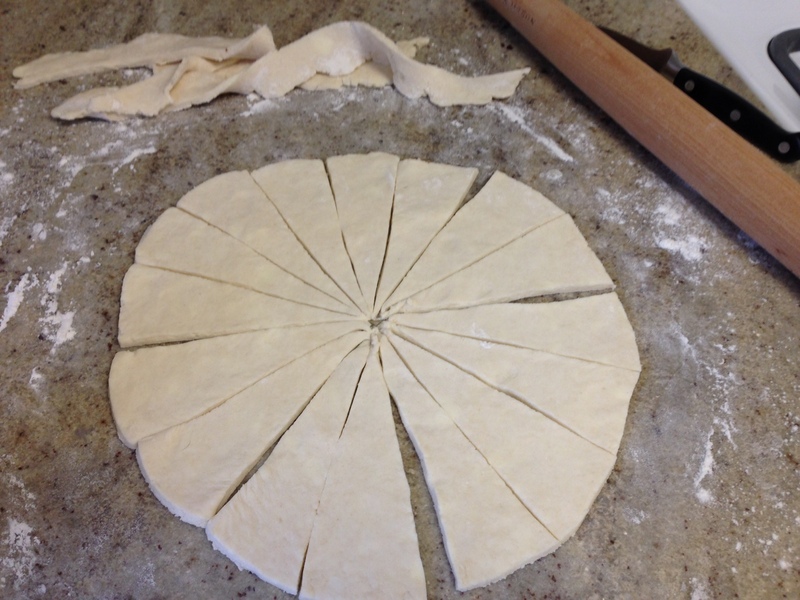 Then, roll each triangle up, starting with the widest end and rolling toward the point, and place them on a parchment-lined baking sheet (with the tip of the triangle tucked underneath the roll, so they don’t start to unravel). 7.) Chill the rolls in the fridge for about an hour. I actually intended to just chill mine for about 15 minutes, but then I went to turn my oven on and realized it wasn’t working (this is commonplace; this oven is trying to kill me, I think), so they ended up chilling for about an hour while I tinkered around with the oven to get it to turn on. This may or may not have involved me climbing on TOP of the stove, to get to the plug in back… I’ll never tell. Anyways, they were VERY firm by the time I got them out of the fridge – and I think this ended up resulting in them holding their shape quite well, so I’ll stick with an hour-long chill next time, too. 8.) Preheat the oven to 400°. 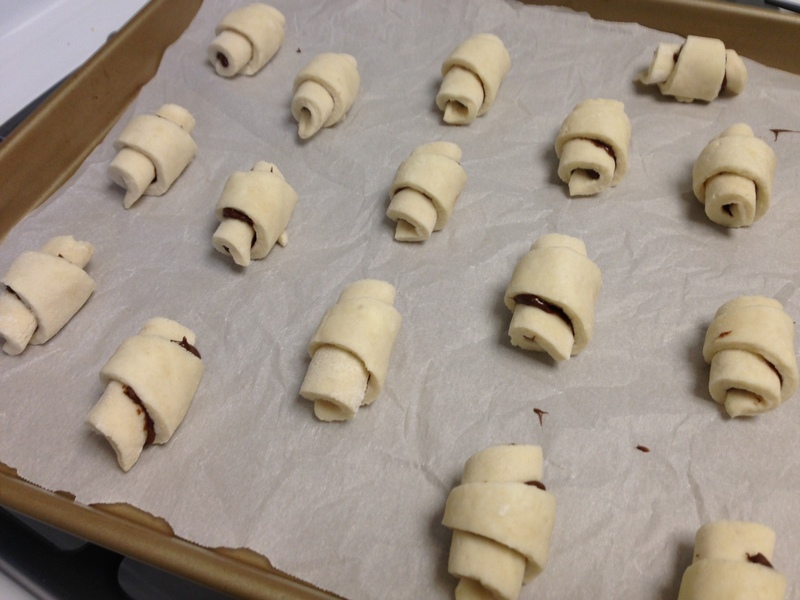 When the rugelach have chilled for about an hour, and the oven is hot, take them out of the oven; quickly brush them with the egg wash, and then sprinkle with the sugar, and pop them into the oven. Bake for 15-18 minutes, until they’re golden brown. Allow them to cool, and enjoy! These tiny, flaky little bites of pastry are absolutely delicious. They’re not overwhelmingly sweet, which is nice – there is just a hint of sweetness in both the filling and the pastry.They would be great for a holiday party, or as part of the Thanksgiving or Christmas (or Thanksgivukkah, this year!) dessert spread; they’re the perfect size to pick up and pop into your mouth, without needing a plate or utensils! They keep quite well in an airtight container for a couple days. If you want to make them a couple days ahead, and are concerned with them being nice and crisp when you serve them, you can pop them into a cold oven, and turn the heat to 350°; when the oven has come to temp, the rugelach should be slightly warm, and crisp on the outside. You could make these savory, too, if you wanted – just omit the sugar from the pastry dough and the topping, and fill with something like goat cheese and sundried tomatoes, or olive tapenade, or parmesan and a small piece of dried sausage. I intend to make these a lot throughout the holidays – they’re quick, easy, adorable, and adaptable in a million different ways! It’s time to start baking holiday treats!